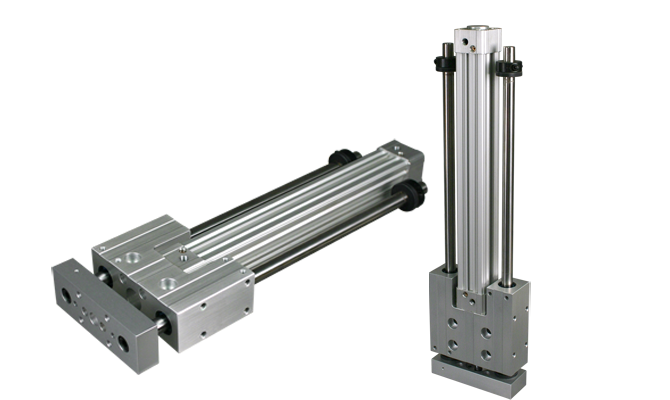 Pneumatic Slide | Robust Versatile Thruster | SK/SL | PHD, Inc.
Series SK/SL Robust Versatile Thruster Pneumatic Slides feature a multitude of options and are powered by PHD’s CV Cylinders. Long or short body styles are available according to the nature of the application. Bushings may be either TC composite or linear ball bushings with the option of oversize guide shafts. Series SK/SL Slides are designed for exceptional performance with a wide variety of options. Wide variety of metric travels and sizes, oversized shafts with PHD's rugged TC bushings, ISO cylinder compatible.